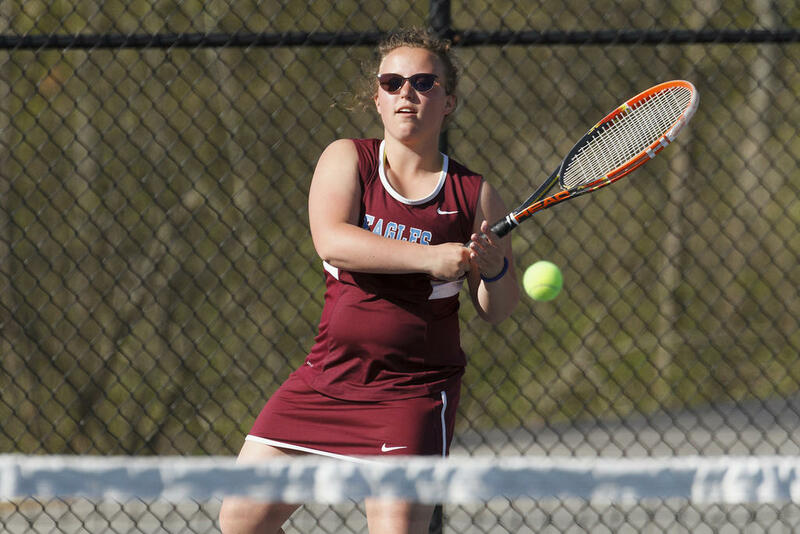 WINDHAM—Eagle Delia Inman bested Westbrooker Rhiannon Doiron at second singles to secure a narrow, 3-2 victory for her girls on Monday evening, May 14. Windham also topped the Blazes at first singles and first doubles. Inman dropped the first set of her bout with Doiron, 5-7, but recovered 6-3 in their second set. The two, both slightly overextended of late, played their third set as a tie-break. Doiron jumped ahead 6-3 in that decisive portion of the match, but then stumbled while Inman surged – Inman battled back and overcame her deficit to triumph 8-6. “Delia showed extreme mental toughness by winning the third-set tiebreaker,” Dresnok said. “[Rhiannon] was up 6-3 in it,” Makin said. “She four chances to win it, and the other girl played tough. She just didn’t go away. Meanwhile, over in first singles action, Windhamite Gabby Smith defeated Westbrooker Maura Rielly in straight sets, 6-0, 6-1. 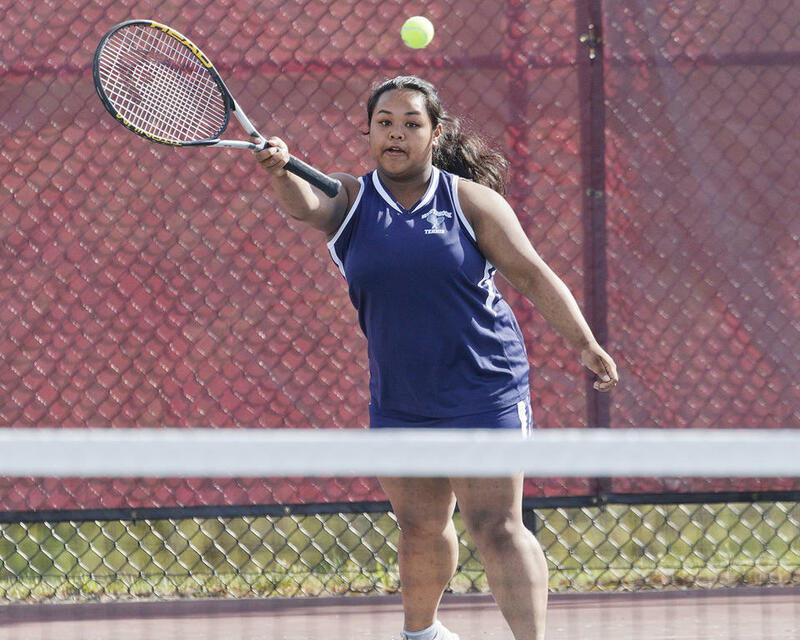 At third singles, the Blazes’ Dalena Bennett and the Eagles Autumn Hall played the day’s longest match. Bennett eventually took the W, 7-6, 6-3. At first doubles, Eagles Rachel Frost and Megan Fleck paired up to sweep past Westbrook’s Phoebe Adame and Jacinda Im, 6-3, 6-2. Last but not least: Westbrook’s other win, which came at second doubles. Kallie Cyr and Alex Thayer worked together to defeat Susi Krebs and Chloe McVetty 6-0, 6-4. Windham advances to 6-4 on the win, while Westbrook slips to 5-4. The Blazes, ranked eighth to start the day, will likely now switch spots in the standings with the Eagles, who entered the contest ranked ninth. Gorham, 9-0, sits in first. Windham has two opponents left to face, this regular season: Kennbunk/Wells at home on Friday the 18th, and mighty Gorham on the road three days later. Three matches remain on Westbrook’s docket, before playoffs kick in. The Blazes host Bonny Eagle on Wednesday the 16th, travel to Sanford two days later and welcome Massabesic three days after that. 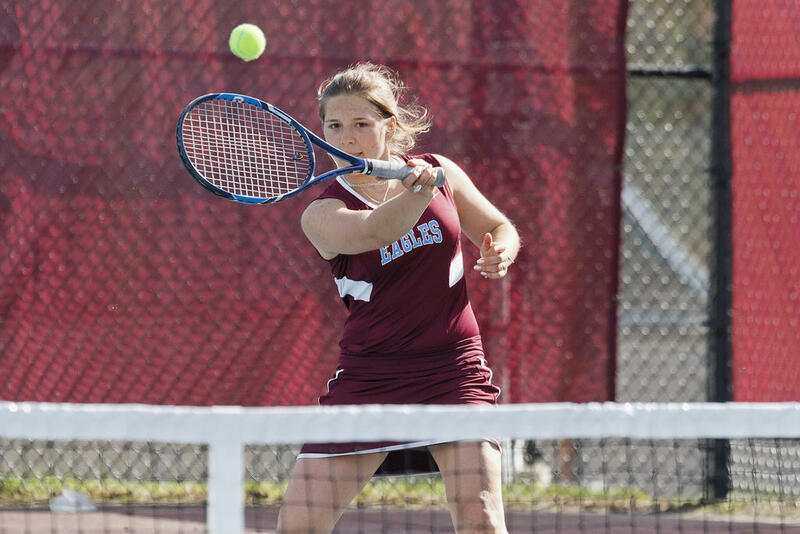 Windham’s Autumn Hall tangles at third singles. 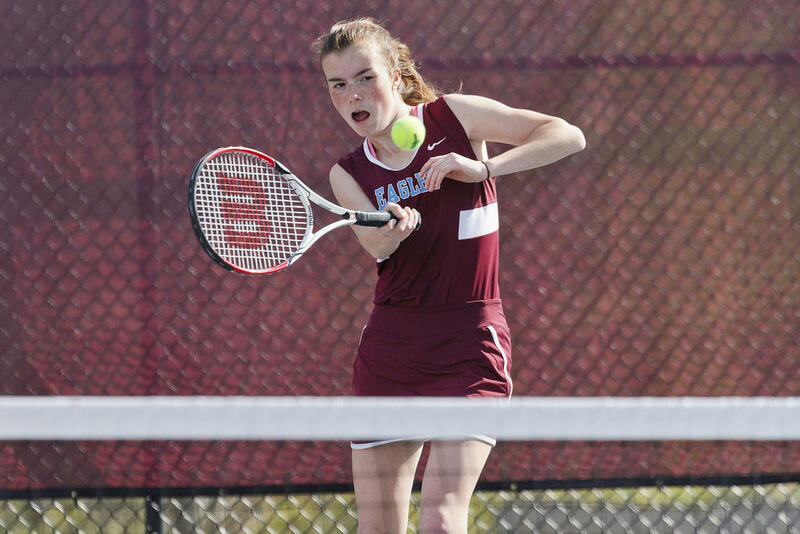 Rhinannon Doiron narrowly lost her second-singles bout with Windhamite Delia Inman, who battled back from a 6-3 deficit to take the “third set”/tiebreaker. 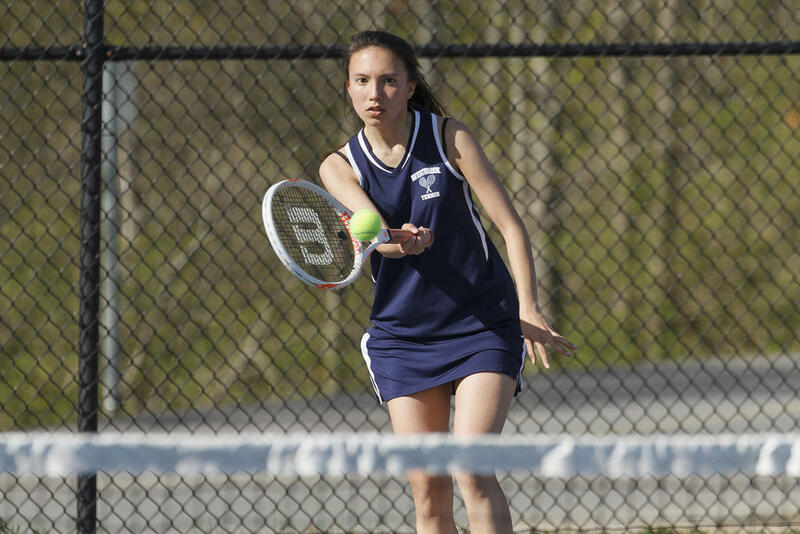 Gabby Smith won handily at first singles for Windham. Alex Thayer returns a ball at second doubles for Westbrook. Kallie Cyr won, alongside her partner Alex Thayer, at second doubles for Westbrook. 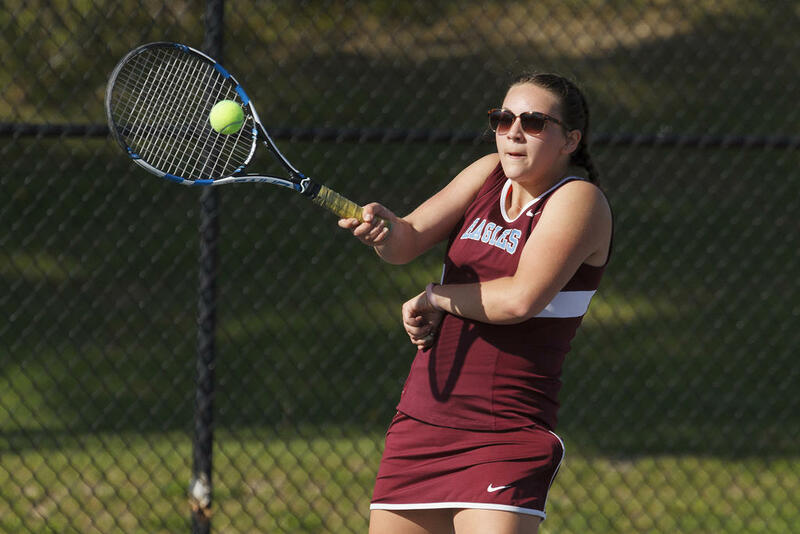 Susi Krebs battles at second doubles for Windham. Rachel Frost volleys at first doubles for Windham. Megan Fleck volleys at first doubles for Windham. 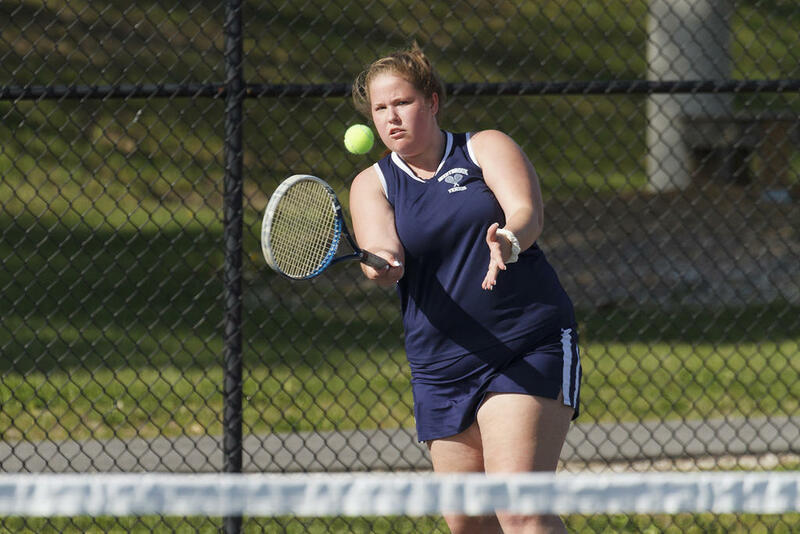 Rachel Frost and her partner, Megan Fleck, won at first doubles for Windham on Monday. Chloe McVetty volleys for Windham at second doubles. It was McVetty’s first varsity match. Jacinda Im paired with Phoebe Adame at first doubles for Westbrook. 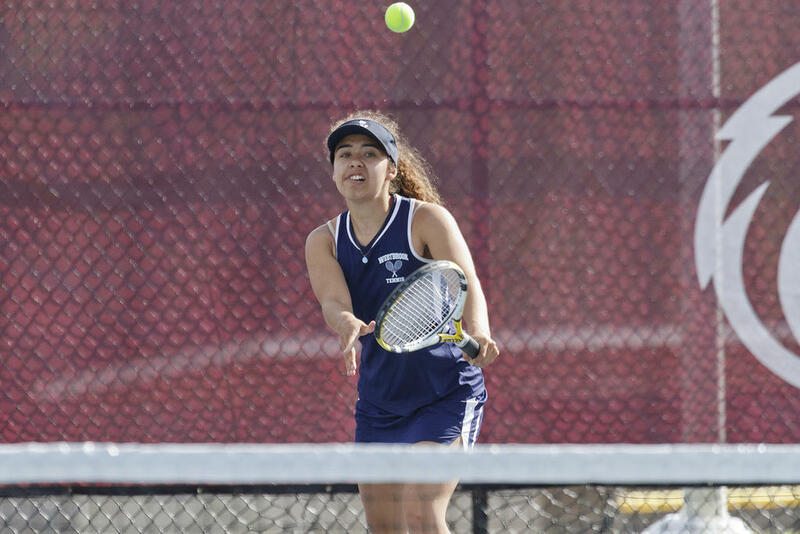 Phoebe Adame volleys, one half of Westbrook’s first-doubles duo. Westbrooker Dalena Bennett volleys at third singles. Delia Inman returns a ball in her decisive matchup vs. Rhiannon Doiron. Blaze Maura Rielly fell at first singles to Windham’s Gabby Smith.